Solomon signed with the Lions as a free agent in May of 2010. Following an NFL try-out in 2012 Solomon re-signed with the club. He re-signed again with the Leos prior to the 2016 season and inked another two-year deal in December keeping him in orange and black through the 2018 season. Following the 2017 season, Solomon signed another 2-year deal taking him through the 2019 season. 2018: Solomon was limited to just four regular season games due to a wrist injury suffered against the Winnipeg Blue Bombers on July 14. When he was in the lineup, Solomon was his typical productive self, amassing 26 defensive tackles. He put on his coaching hat during the back half of the season, signalling in plays for the defence from the sideline. Solomon was able to heal in time to start at middle linebacker for the Lions in the East Semi-Final against the Hamilton Tiger-Cats, where he had five tackles. 2017: Setting a standard for linebackers across the league, Solomon was the heart of the Lions’ defence once again in 2017. Breaking his own record for defensive tackles in a season with 144, the veteran appeared in all 18 regular season games and added six more stops on special teams along with a sack, six tackles for a loss, five quarterback pressures, a pair of pass knockdowns and a fumble recovery. His remarkably consistent play was recognized by his nomination as the Lions’ Outstanding Player and Outstanding Defensive Player. Hitting double digits in tackles six times during the season, Solomon’s most productive outing came in Montreal on July 6 when he piled up 15 stops. His combined tackle total of 150 including six special teams stops is the second-highest combined total in CFL history behind his 2014 mark of 151. 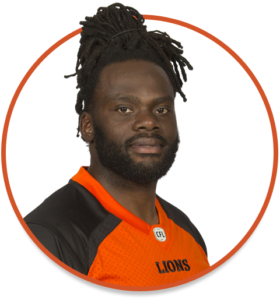 2016: Another prolific and dominant campaign for Solomon as he returned from a season-ending injury in 2015 to once again lead both the Lions and the CFL with 129 defensive tackles. Paired alongside Adam Bighill, the dynamic duo became the first teammates in league history to surpass the 100-tackle plateau in the same season. Adding eight sacks, an interception and two tackles for a loss, Solomon earned the second Most Outstanding Defensive Player award of his career along with his third CFL All-Star selection and his fourth West Division nod. 2015: Solomon started six games for the Lions at linebacker, but had his season cut short after suffering an Achilles injury in Hamilton on Aug. 15. He finished the year with 43 defensive stops, two sacks and an interception. 2014: A historic and record-breaking year for the fifth-year linebacker whose 18-game path of destruction through the CFL included a new league standard of 143 defensive tackles to go along with five sacks, seven tackles for a loss, three fumble recoveries and an interception. 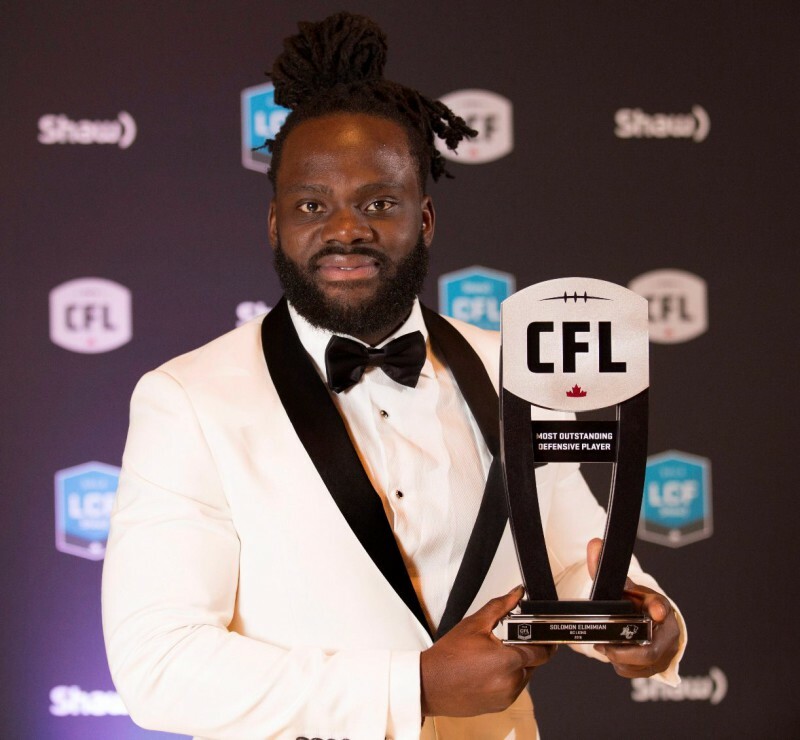 The incredible numbers earned Solomon the CFL’s highest honours as Most Outstanding Player and Most Outstanding Defensive Player as well as West Division All-Star and All-Canadian nods. 2013: Solomon played 15 of the Lions’ 18 regular season games last year finishing second in defensive tackles with 73 to go along with three sacks and a career-best three interceptions. He recorded four tackles for loss and forced a pair of opponent fumbles leading to turnovers. Consistent and reliable, Solomon recorded nine games with five or more tackles in 2013 and five games with seven or more defensive stops. A late season injury prevented Solomon from playing in the Western Semi-Final. 2012: Solomon rejoined the Lions in the later stages of the 2012 season following his release from the Minnesota Vikings and subsequently the Cleveland Browns. He played six games along with the Western Final playing alongside Adam Bighill as well as a role on special teams. He finished the season with 16 total tackles. 2011: In his second full season with the Lions, Solomon blossomed into one of the finest linebackers in Canada. He had an all-star season, being named to both the West Division and All-CFL squads. Solomon finished second in the CFL in defensive tackles with 98 and third overall with an even 100 including his two special team stops. He missed two games due to injury and started all 16 games that he dressed for in 2011. He also played both post-season games and had six tackles in the 2011 Grey Cup victory. 2010-2016: Through eight incredible CFL campaigns including his mid-season return to the Lions following an NFL bid in 2012, Solomon is considered among the best linebackers in the CFL and one of the very best in team history. Anchored by his remarkable 2014 season in which he set both league and team marks with 143 defensive tackles, followed-up by his second Outstanding Defensive Player award in 2016, and another record-setting campaign in 2017, Solomon is the club’s all-time leader with 719 tackles and 755 combined tackles. He is also the only player in league history to win three different Outstanding Player awards. 2005-08: Elimimian played in 14 games for the Warriors in his senior season and led the team with 121 tackles, including seven games with 10 or more. Wrapping up his career as Hawaii’s all-time leading tackler (434 tackles) and second all-time in the WAC, he was named WAC Co-Defensive Player of the Year and also added 10.5 TFL, four sacks, five pass break-ups, one forced fumble and a fumble recovery. Solomon began playing football in grade 9. Prior to that, his mom’s fear of injury limited his gridiron experience to touch and flag football only. He was also a talented baseball player in high school. While enrolled at Hawaii he received All-WAC academic honours and majored in English.